In moving furniture last week, several rolls of paper were found, having fallen behind a cabinet perhaps ten years ago. 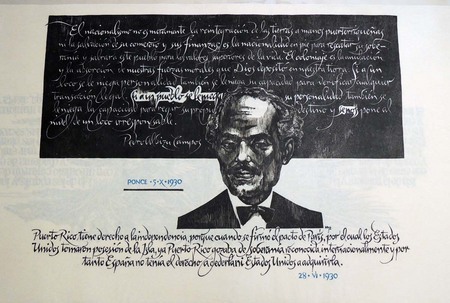 No damage was done and we now have three enormous woodcuts back in the collection of the Puerto Rican master printer Lorenzo Homar where they belong. Isla de amor y mar enamorado. el torso de las dunas. Isla de amor marino y mar embelesado. listo para la fuga, alerta y tenso. Nationalism is not merely the restoration of its lands to Puerto Rican hands, nor the salvation of its commerce and its finances; it is the nationality that stands to redeem its sovereignty and to save for its people their superior values of life. Colonization is the nullifying and the absorption of our moral forces that God entrusted to this land. If to one madman a people denies its personality, * also denies its capacity to verify any form of legal transaction. If to one people its personality is denied, also denied is its capacity to rule its own destiny and we are placed at the level of an irresponsible madman. Puerto Rico has the right to its independence because when the agreement of Paris was signed, by which the United States took possession of the island, Puerto Rico had already enjoyed international recognition of its sovereignty and it is for this reason that Spain did not have the right to cede it in as much as the United States did not have the right to acquire it.